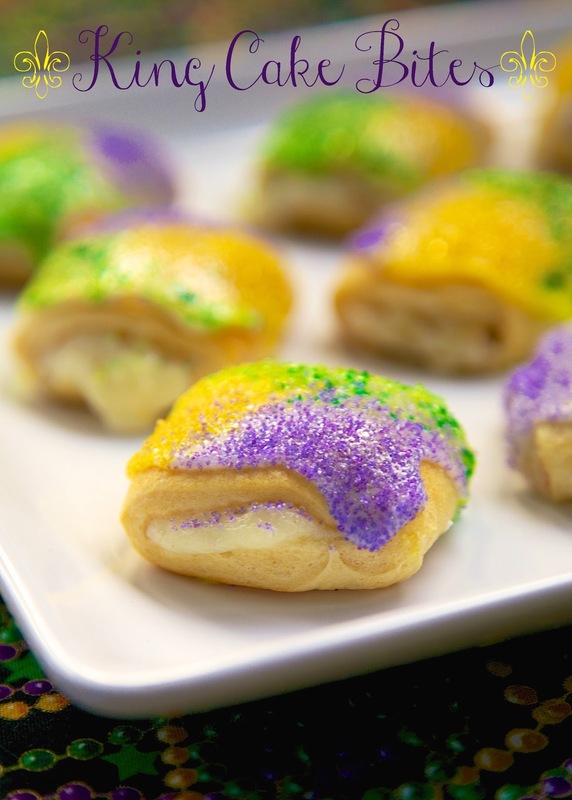 Easy King Cake Bites - crescent rolls filled with cinnamon and cream cheese, topped with icing and colored sugar - DELICIOUS! Great for breakfast or dessert! No Mardi Gras celebration is complete without King Cake. In the simplest of terms, King Cake is basically a cinnamon roll. It is a sweet dough with cinnamon and sometimes a filling that is topped with icing and colored sugars. I have a couple of simple King Cake recipes on the blog. This year I went for a bite sized treat with these King Cake Bites. I took some crescent rolls, sprinkled them with cinnamon, filled them with a yummy sweet cream cheese filling and baked them. I finished them off with some frosting and sugar on top. One word - AMAZING! We could not stop eating these. They really do taste like little King Cake bites. These would be great for a class party, Fat Tuesday breakfast or just anytime for a treat. We ate these for dessert and breakfast the next day. We warmed them in the microwave for about 5 seconds. Seriously good! Beat cream cheese, 1 cup powdered sugar and lemon juice with mixer until well blended. Separate dough into 8 rectangles; seal seams. Sprinkle each rectangle with approximately 1/4 teaspoon of cinnamon. Spread cream cheese mixture down middle of each rectangle. Fold each rectangle lengthwise into thirds to enclose filling (bring long edges up to cover cream cheese); cut each into 4 squares. Place, seam-sides down, on baking sheet. Bake 13 to 15 min. or until golden brown. Cool slightly. Mix together remaining 1 cup powdered sugar and milk. 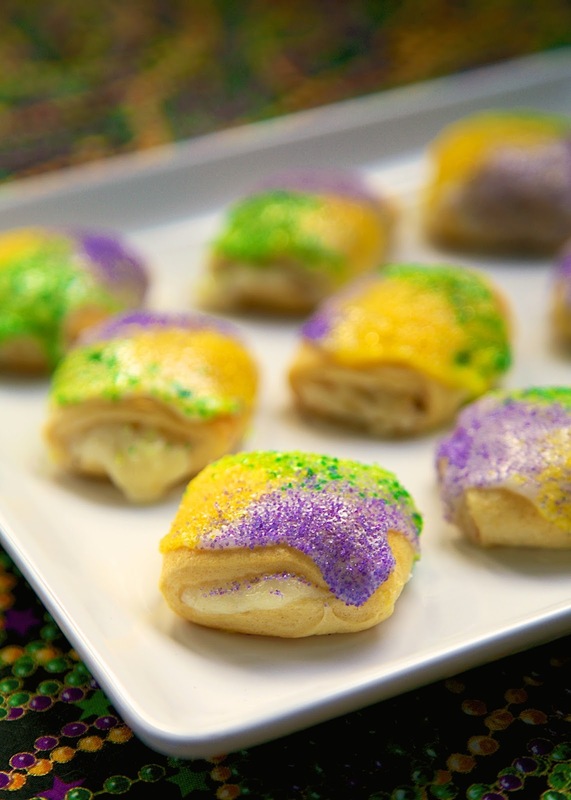 Spread on top of King Cake Bites and sprinkle with colored sugars. Breakfast on Fat Tuesday for those of us who have to work and for those of us who know longer have to fit into a ball gown. These look so good! Can't wait to try them. Do these need to be refrigerated? Or can they be made the night before? You could make the filling ahead of time and baked when you are ready to eat.